Debbie is sent to stay with her older brother and his wife (who run a livery and training stables) when her parents get divorced. Debbie, although she likes horses is inexperienced and feels out of place at the stables. She gradually learns to ride better and look after the horses and is starting to feel more at home when a series of disasters strike the stables. Brother Simon has an accident, Derek crashes the horse-box, owners takes away their horses. In the meantime Debbie falls in love with Cleo, an unmanageable mare whom everyone else thinks is mad and worthless. Debbie feels a strange affinity for the mare, both of them being outsiders, not really belonging. She begins to lunge and then ride her and finds out she is a brilliant jumper. Debbie know then that she wants to stay at her brothers with Cleo as her own pony, but both sets of parents want her to live with them. And as Cleo’s jumping prowess improves, her value increases and Simon and Tina may need the money from selling her if they are to continue with the stables. How will Debbie’s dreams come true against all these odds? This has always been one of my favourite books by this author. It is however one of those books which can be appreciated on a far deeper level when re-read as an adult. As well as containing all the requied elements for a good pony yarn – the hopeless horse who is transformed by the devotion of a dedicated girl, the rider metamorphosing from hopeless to brilliant, the yearning of a pony-less girl for a horse of her own – the story also has a far deeper undertone. Of the three P-T sisters, Christine tended to explore more fully social and family problems and the emotional turmoil they cause. In this case it is how divorce effects a child. Debbie is seen to be deeply effected by her parent’s split. She seems to have a feeling of not belonging anywhere. This is skilfully done by the author who shows Debbie’s discomfort in both the world of the stables and the worlds of her parents. 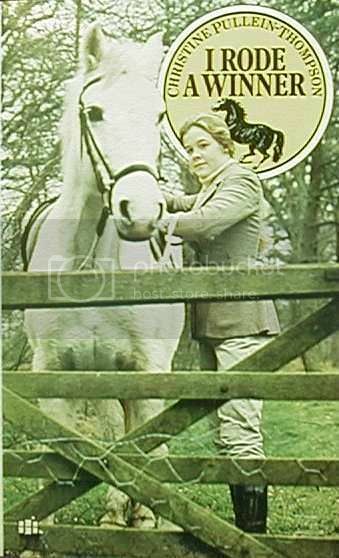 When Debbie is at the stables her lack of horsy expertise makes her feel the odd one out next to the competence of Derek and her brother and sister in law, but when she is with her parents in both Oxford and London she finds town life suffocating and doesn’t feel like she fits in their either. With the possible exception of K M Peyton, Christine explores emotion in her characters to a far greater extent than most other pony book writers. We really feel that we are inside the head of the character. The first person narrative also helps achieve this empathy. As with all good literature the character of Debbie changes and grows throughout the book. As she learns to overcome her problems, and aided by her close relationship with Cleo, Debbie begins to feel a sense of belonging at the stables. She finds a new identity as a horsy girl as she learns to both ride and look after the animals. But just as she has found this, a terrible crisis at the end of the book threatens to tear it all apart. In order to overcome this and find happiness she must very quickly grow up. The ending of the book is quite hard-hitting, reminiscent in some ways of the ending of A Dream of Fair Horses. It is actually a ‘happy ending’ but in an era of dream-come-true endings seen in so many pony books, the climax of this story is different to how the reader may expect. I do feel however that this ending is integral to the growth of the character of Debbie. And it is her eventual acceptance of her fate that finally brings her happiness and stability in her life – and the chance to actually find her dreams coming true after all. This is a great book to read on many levels and will be appreciated at these different levels by different age groups – which I always feel is the true test of a great book, pony or otherwise. An excellent combination of a pony story and the struggle of a girl to find stability in a suddenly frightening and changing world. I also like this one too. I always remember the part where Debbie has to ride Cleo in her first show jumping competition and she finds out there is a water jump and she has never jumped one before. I don't know why that part sticks but it does! I do think that her miraculous change...in just a few weeks...from beginner to such a good rider was a bit unrealistic. This is one off my favite books, the main character I realy like as she shear's the same 1st name as I have Debbie.